Afraid of the Swine Flu? Or is she a playing a cowboy or planning on robbing a bank? Ugh, stupid cosplaying is the likely answer! or maybe she’s at a protest and doesn’t want her face on the camera of the police state? 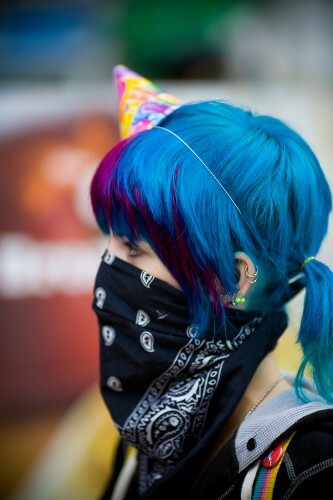 Or she’s at a punker-banditos theme party! Oi! Arriba! Or maybe she’s a total uggo. I don’t know, but I reckon I deserve a MCS+ account for pointing it out for you. This isn’t real. Her ears, the little space behind her ears and the thin bits of hair have blue around them where it shouldn’t be. Unless her hair is luminescent, this has likely been digitally altered, perhaps with some sort of photo-manipulation computer program. Good catch, my man.The top of the ear is pretty telling, as well. This is badass, love the contrasting colors.